Like the middle child, lunch doesn’t always get the attention it deserves. I try to instill a “good start” to the day with a healthy breakfast… and I focus on home-cooked dinners. But in between? Lunch is just as important! Pack a chunky, healthy granola bar instead of a sandwich. I promise, the sandwich police will not get you. Who says you must pack a sandwich for lunch? My daughters love packing “big salad” for lunch. It’s always an “everything but the kitchen sink” kind of project. Add a leftover chicken breast, sliced on top for protein. Or add a scoop of tuna salad, a sliced hard-boiled egg or “crab delights.” Plus lots of veggies of course and a little container of salad dressing. Along the same lines, my kids love packing pasta salad for lunch. Pizza pasta salad is fun, with tomatoes, olives, green or red peppers, cheese and pepperoni. Add pasta and Italian dressing and voila! Potato salad is also a great choice to beat the lunch routine blues. It’s a great, substantial choice for tiring gym days. Pair it with an apple and pretzels… yum. Once in a while, treat your kids to a slice of leftover pizza in their lunchbox. But a word of warning: Their friends will be jealous and will ask their parents to do the same thing. You might get in trouble with other parents! Greek yogurt is all the rage and my daughters love it. Packed with protein, it’s just as substantial as a sandwich. Pack one of the larger cup sizes with a container of granola to sprinkle on top, plus a piece of fruit, and they’re good to go. My son, on the other hand, loves a hot lunch from time to time. He especially enjoys leftover mac ‘n cheese, spaghetti, or pasta casseroles. Invest in a small Thermos container and take time once a week or so, to warm up a leftover crock before school. It will stay warm til lunchtime and make your son (or daughter’s) day! Again, this is often a “meal of envy” around the cafeteria table so proceed with caution. If your child likes tuna salad, chicken salad, etc… rather than making a sandwich, pack a container of the salad along with healthy crackers. Either dip the crackers into the salad or pack a plastic knife/spoon for spreading. Fun! Purchase alternatives to bread: Create all-new “sandwiches” with artisan rolls, pita pockets, tortillas for wraps, etc. It gives your ham & cheese a whole new outlook. One of our family’s absolute lunchbox faves: Chicken Salad Sandwiches. This recipe came from a 1st grade cookbook my oldest daughter made as a Mother’s Day project 11 years ago. So I owe a debt of gratitude to her friend Christina’s mom for sharing the recipe–as I have told her several times through the years. It’s a winner! 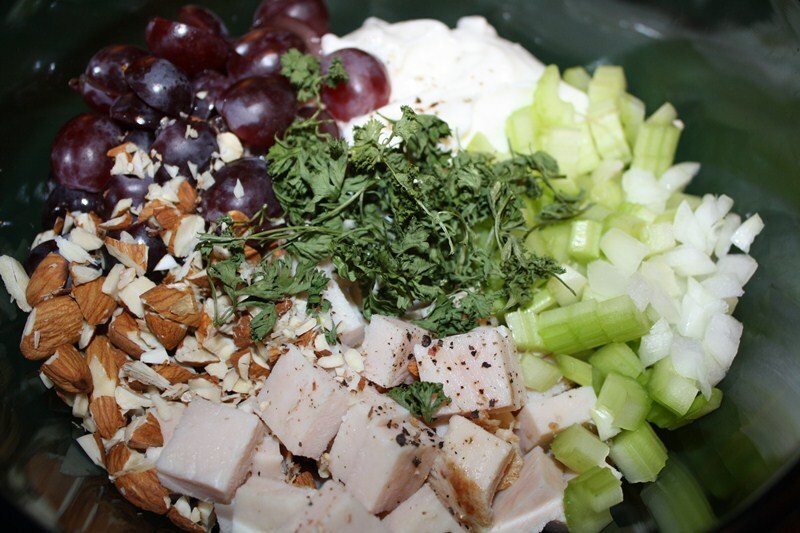 Part of the reason is the creative mix of ingredients–a tangy dressing, crunch of celery, sweetness of grapes, and toasty almonds. My children all know the recipe by heart and it’s a fun family project to mix it up together. It never stays in our frig for long. Mix everything together, tossing lightly. Enjoy! If you have elementary-aged children, there are so fabulously creative lunchbox ideas flying around Pinterest these days. 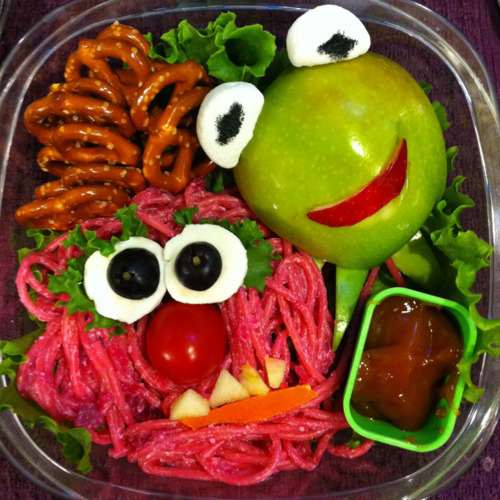 I’ve started a board on our Off the Merry-Go-Round Pinterest page called “Lunchbox Fun”–check them out! Edible Muppets? 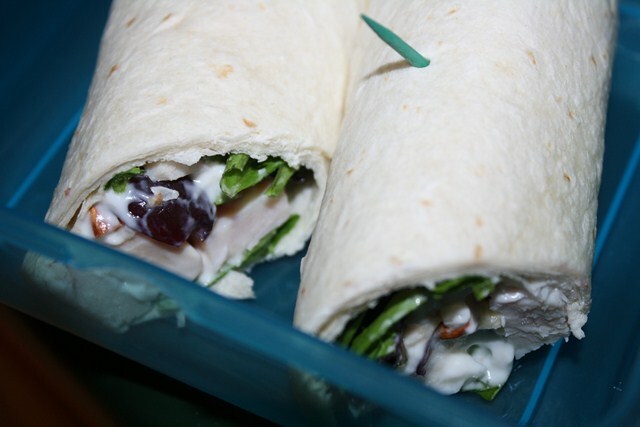 Find this idea on our Pinterest page… Advanced lunchbox packing 301. As always, feel free to share your ideas and strategies… how do YOU keep the lunch routine easy, healthy and delicious? 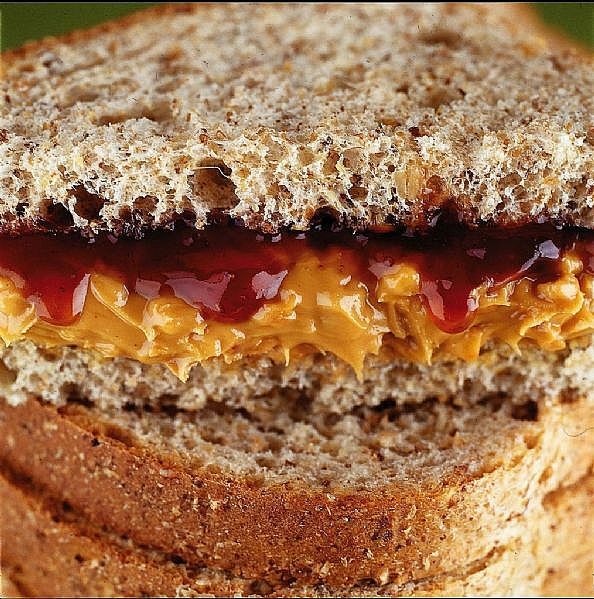 To this day I love PB and J! To mix it up I do PB and honey! PB&H sounds amazing… Thanks for the tip, Robyn! I am glad to know the thermos stays warm with food until lunch. Salads are the best……that is where I need to focus. That chicken salad recipe does look really good!!! Club rolls make my guys really happy because I don’t buy then all the time. Good post, thanks!